Off stage mutterings from Central Theatre Supplies: An old friend with a new body! An old friend with a new body! The Transcension Scene Commander makes its debut! 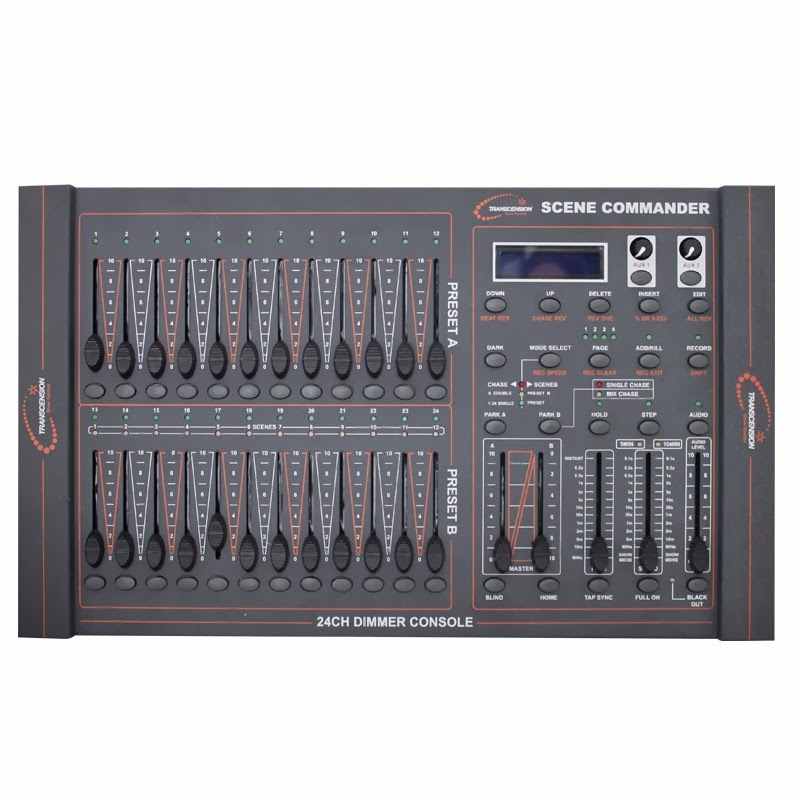 As LED PAR cans made their way in to our sales range about 3 years ago, we struggled for a little while to find a cheap DMX desk that could control them and provide some of the functionality that small drama groups and schools would need i.e. fader per channel, ability to store memories and basic chases. We eventually discovered an offering from Botex that cropped up in a variety of guises (as it turned out) that we could buy from the same supplier as our LED PARs and we sold a couple of dozen of them which are continuing to serve faithfully. As is often the way with this technology, the experience of selling a few thousand informs the next 'generation' of the family and in December we were introduced to the Scene Commander. As with it's predecessor, it's a 12/24 desk which means you can operate it in 12 fader two preset mode or with the press of a button in 24 fader two preset mode (though it stretches the brain remembering what's where on the faders). 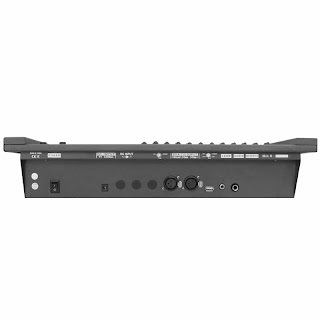 In this version also, the faders can re-assigned within the DMX range of the desk i.e patching so that you can bring together common features on things like LED's or basic moving heads. It also has two rotary auxiliary controls which can patched to a DMX channel so you get more accurate control over strobe flash rates (for example). The desk is housed in a metal case and can be rackmounted if you so wish, but many folk won't bother and the metal case gives a feeling or sturdiness it's predecessor was missing. It outputs DMX so should work with most DMX devices and for the first time in this price range, comes with 5pin and 3pin outputs on it's back panel! It also has a USB connector to power a desk lamp - though you might be courting fate to try and charge a device from that port. There's also an audio input so that you can run chases to the beat of a soundtrack and a remote control input for a foot switch to allow you do remote blackouts. 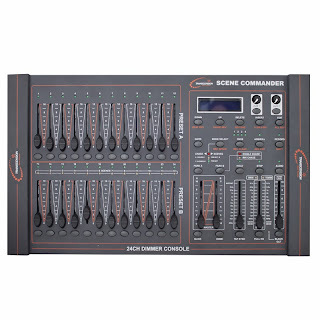 All in all, we think it's rather a neat desk for £135 for 24channels of DMX control, if you'd like to have a close look at one - we have one on display in our shop. If you want to order one, they're on our eShop here.